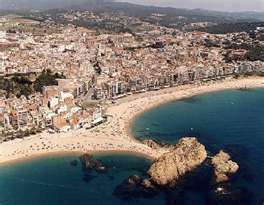 The most southern holiday resort on the Costa Brava, Blanes is not only known to attract international tourists but also vast numbers of Spanish holidaymakers. Like many coastal towns, Blanes has changed many times from a postcard perfect fishing village to a tourist paradise. The resort has a 3km (2 mile) long stretch of coastline which offers beautiful beaches consisting of many soft sandy bays, rocky coves and is lined with high-rise hotels and apartments which is all perfect for sunbathing. To be found in the depths of the town are many reminders of the towns past, such as the medieval castle of St Joan, various churches and many other ancient buildings, which have attracted and still do, many hundreds of tourists year after year. Two botanical gardens which each boast thousands of plant species are said to be the pride of the town. Although Blanes may seem like a typical tourist resort, it also prides itself in offering visitors a taste of real Spain with many traditional street markets, fiestas and folk dancing fairs. Blanes has more than 150 restaurants to offer, many of which are located on the promenade. Locals tend to frequent the smaller eateries which are behind the promenade. Fresh seafood is highly recommended, as are local Catalan dishes. Although not the most sought after for the nightlife, Blanes offers several British-style pubs which stay open till late, but if quality nightlife is what you are after then it is recommended to head up coast to Lloret. Although at the end of July each year, Blanes hosts the Costa Brava International Fireworks Contest which brings the seaside town alive with fiestas lasting late into the night. Recommended activities are activities such as taking the kids to the Waterworld (known to be Europe’s biggest waterpark) near Lloret de Mar, or to Marineland which is just a short drive south of Blanes and allows you to see dolphins, sharks, turtles and sea lions. Barcelona is also close enough for a day trip at just 100km (60 miles) away. Blanes also offers many excursions and boat trips around the island. Other activities such as scuba diving, sailing and windsurfing are also available meaning much fun can be had. For a more relaxing activity, why not have a round of golf around the Real Gold de Bendinat which offers breath-taking views of Palma bay, or maybe even pay a visit to the Marimirtra Botanical Gardens is also highly recommended. If willing to travel, just 7 miles away in Palma, you could visit the gothic cathedral. Holiday shopping doesn’t get much better than at Blanes, with over 700 shops from boutiques and supermarkets to smaller, more traditional retailers. The best place for souvenirs and cheap clothing is the Monday morning market at Passeig de Mar. Also, every afternoon the local fishermen sell off the days catch here. For fresh goods and groceries a visit to the daily Muncipal Market in Mas Enlaire is also recommended. No matter what activity you wish to partake in, there will always be something to do no matter your age or gender. Book your Air Holiday now! at Flysunways.com we has many fantastic deals on Hotels, accommodation and flights. Booking is easy just use our live booking system.